Attacks are growing, evolving, and becoming more sophisticated. And the types of attacks we see are proliferating. How do you protect your crown jewels when the castle has no walls? The answer is at the edge. 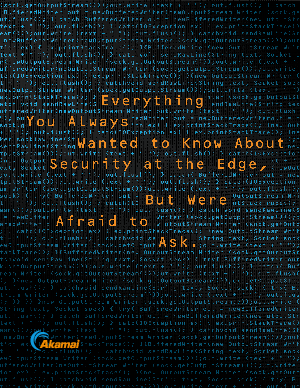 When you deploy security at the edge, you are protecting your changing assets closer to the attack itself and moving digital experiences closer to users. In essence, you're deploying a single pane of glass, an extension of your infrastructure, that sits between you - your users, your digital experiences - and the always-changing nature of today's digital environment.